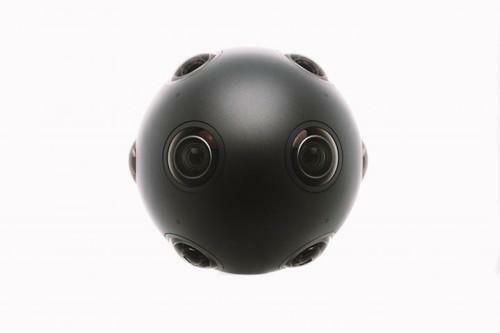 On July 28, 2015, Nokia announced the OZO virtual reality camera, a spherical device with eight image sensors and eight microphones. Nokia has developed a camera for enterprise users that can help turn everyday surroundings into virtual reality (VR) imagery for games and other applications. The OZO VR Camera can capture images and sound in a 360-degree panorama, and the content can be published for use by VR headsets like the Oculus Rift. The OZO somewhat resembles a Google Street view camera in that it's shaped like an orb and has cameras pointing in all directions. However, it also has a protruding stalk so it looks a bit like a gourd. Aimed at professionals in content creation, it captures 3D stereoscopic video through eight image sensors and eight microphones mounted on the sphere. That means that if a sound is recorded as coming from a certain direction, it can be reproduced with VR gear. Software developed for the device allows users to see 3D imagery in real time, and there's no need to stitch together panoramic images, according to Nokia. It could speed the process of rendering everyday recordings into VR imagery. Nokia also announced a commitment to support OZO by California-based VR production company Jaunt, as well as a contest for proposals for immersive VR short films. OZO will be produced in Finland. Pricing, specifications and other details are to be announced ahead of OZO's release in the fourth quarter of 2015. The camera comes amid a big push to popularize VR, especially for video games, by big tech brands. Aside from Oculus, recent VR platforms have included Sony's Project Morpheus, Samsung's Gear VR, the HTC Vive and Microsoft's HoloLens, which is aimed at augmented reality applications. The OZO is a new direction for Nokia, which pulled out of the consumer market with the sale of its smartphone business to Microsoft and is reportedly in talks to sell its Here mapping business.